I know the feeling, this was me when I first started my online business. I posted in Facebook groups with my baby in my lap napping. I answered questions with tips and tricks to make connections and show I knew what I was talking about while making lunches. I searched in Facebook group for people to help in hopes of gaining clients. I was tired of searching, tired of the rat race. As a virtual assistant I was in a fierce competition, there would be dozens of responses to a post in a group where someone was seeking help. I was feeling spammy commenting after SO many people already commented and messaging potential clients, hoping to stand out enough to get the gig. If I took time away from the Facebook groups, I was missing opportunities to get more clients, opportunities I couldn’t afford to miss. So I was strapped to my laptop, chasing leads. I was just getting started, after quitting my teaching career and going out on my own on faith alone. Running ads were not in our budget whatsoever. Any extra we had I was using to LEARN and GROW my business, not advertise. I ended up stressed and close to burning out before I ever really got started. I sat up at night thinking that there had to be a better way, this can’t be the only way people run their businesses online. That's when I fell in love with Pinterest. I saw the potential Pinterest had for EVERYONE when I was managing a blogger’s account. I saw the need for female entrepreneurs to gain that website traffic for their business and that’s how my business was born. 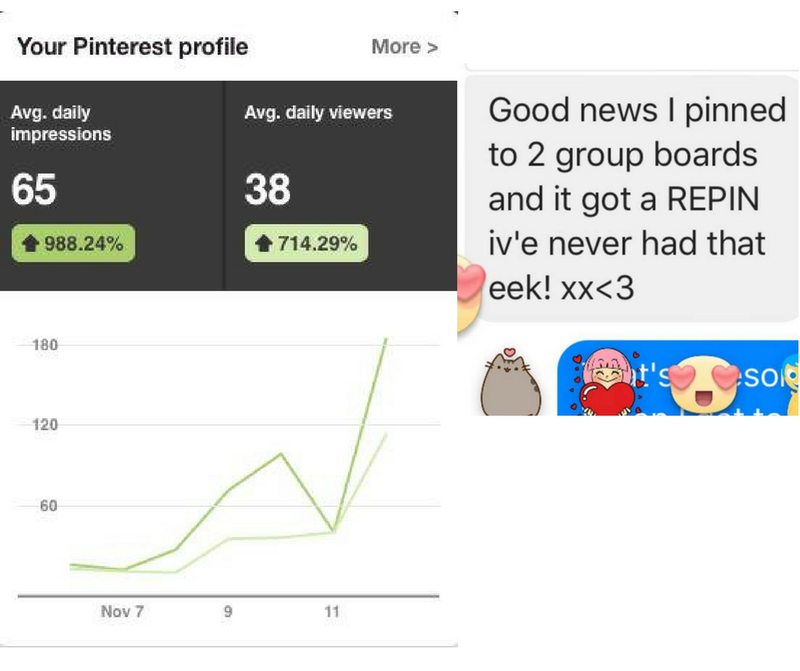 As a result I created my signature program, Pinterest for Profits, as a way to help female entrepreneurs break free from the social media rat race, increase her visibility and build her business with ease. You need someone to SHOW you. Screen share lessons so you don’t click the wrong thing and screw up all your work. Are you ready to discover who your ideal client is so you can meet their needs? Are you ready to grow your business with ease by discovering EXACTLY who your ideal client is and start to build your tribe with those willing to invest? Are you ready to grow your list with warm leads and turn them into paying clients without scary Facebook ads or crazy ad investment (all organic baby)? You know your tribe is searching for you. A 9 week program for the female entrepreneur ready to expand brand visibility, increase her leads and book out her programs through the power of Pinterest. Use this week to create a few pieces of content, create that killer opt in and get everything flowing to grow your list and start nurturing those new leads! A client of mine, Rachel, was using Pinterest for her business when we met. She was putting out boat loads of amazing content. I am talking about several podcasts AND blog posts a WEEK. A Pinterest DREAM! Only it wasn’t doing ANYTHING for her business. WHAT?! All that content and Pinterest was only responsible for 4% of her website traffic. There was a HUGE problem here! Rachel KNEW her tribe was on Pinterest and wanted to reach them, yet she was getting NOwhere on her own. All her wonderful content had been just SITTING there!! It was heartbreaking! Rachel and I chatted about her options, either DIY with my course or allow me to optimize it for her. She decided to let me go ahead and knock it out and with in a week her website traffic from Pinterest soared from 4% to ALMOST 50%! We took an account that was full of amazing content that no one was seeing and grew it to a huge source of website traffic in a week! Rachel is now able to reach MORE people to serve in her business! This the reason so many women NEED Pinterest! Truly discover who you want to attract to your brand and business (i.e. your ideal client) so you become clear on how to connect with them on a much deeper level than someone else in your industry. Pinpoint their limitations, struggles and what they desire most in order to develop messaging that has them responding with, "It's like you're in my head!" - For example, Week 2 begins Tuesday, March 27th, so the call for week 1 will be Monday, March 26th. -This is a LIVE group program, we will have weekly Zoom calls weekly throughout the program with the exception of the implementation weeks built in for you to complete tasks before moving on to the next modules. - You will have access to me during the weekly calls for additional training and a Q&A session. -You will be able to work through the course at your own pace, just remember that the LIVE calls will not be recorded, but you won't have access to the live support after the program ends.